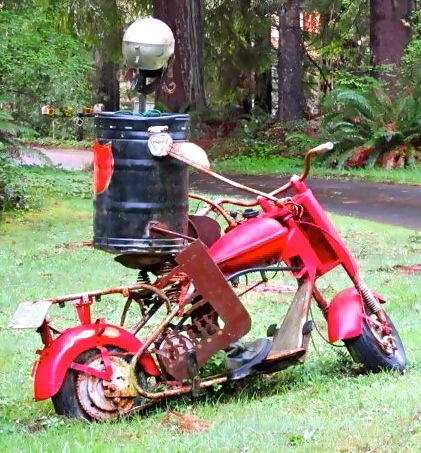 ARCATA – Phylis Geller’s Fickle Hill Road front yard features a Linda Wise “Beer Belly” Junk Art Sculpture depicting someone doing what she involves herself in often as possible – riding a motorcycle. On Saturday morning, July 7, just before 7 a.m., Geller was headed into town when she noticed “a strange fellow ambling down Fickle Hill Road just below the Redwood Park water tank. The man, clad in green sweat pants, was wearing what looked like a duct-taped crash helmet and a trench coat. Because of his “clownish” look, Geller, a frequent Facebook poster, considered taking a picture of him, but thought better of it. 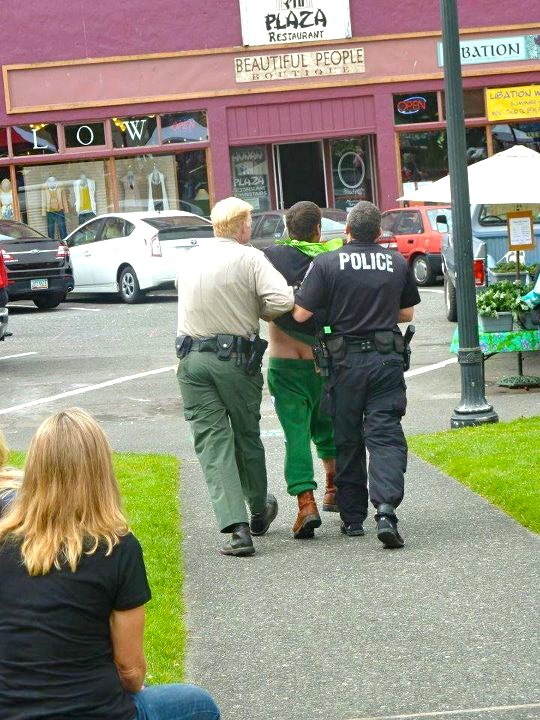 Within minutes, Green Pants Man had generated a call to police about “a subject yelling on Trail 1,” a white male adult wearing a silver helmet. A witness said Harnden had threatened to “stomp babies,” evoking the April incident in which traveler Molly Barnes did just that on the Plaza. The witness said Harnden was bracketed by mothers with strollers when the incident occurred. One of the moms appeared aware of the menace; the other was oblivious. Harnden was arrested on charges of resisting arrest and violation of probation. He was on probation for prior convictions for disorderly conduct and public intoxication. Sgt. 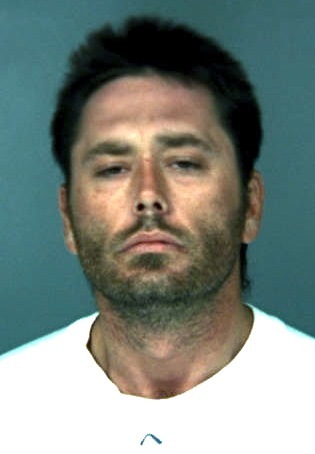 Ernie Stewart of the Humboldt County Sheriff’s Office said that Harnden had been booked into the Humboldt County Correctional Facility “in excess of 25 times” for violations including public intoxication, vandalism and resisting arrest. Harnden was arrested again on July 12 for alleged public intoxication. No helmet = sad Phylis. 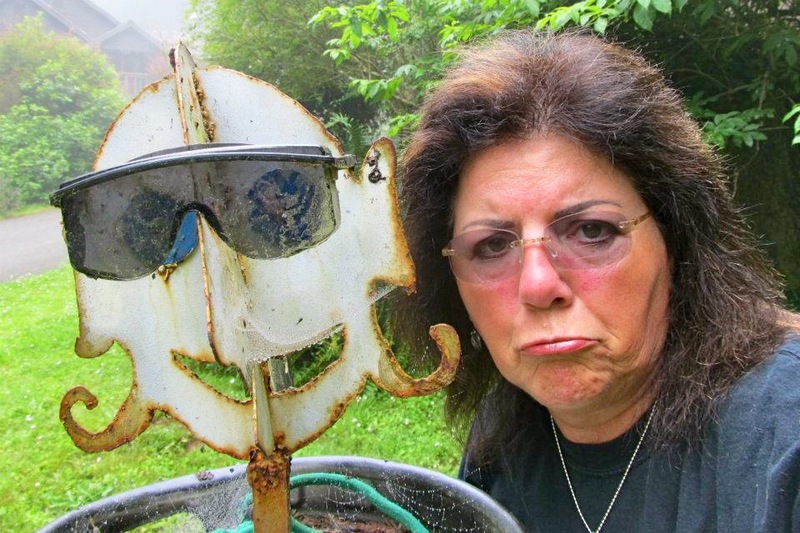 Geller later realized that Harnden’s headgear that morning had been pulled off of her yard sculpture. The HCSO had possesion of the property Harden was carrying that day, and after a certain amount of rigamarole, on July 13, Geller was able to reclaim it and replace it on her sculpture. “Well done, Jan at APD and Deputy La Garda at the HC Sheriff’s Dept.,” Geller wrote on her Facebook page. A caller to the Eye claiming to be a relative said Harnden suffers from a bi-polar disorder, and is a person of fine character. 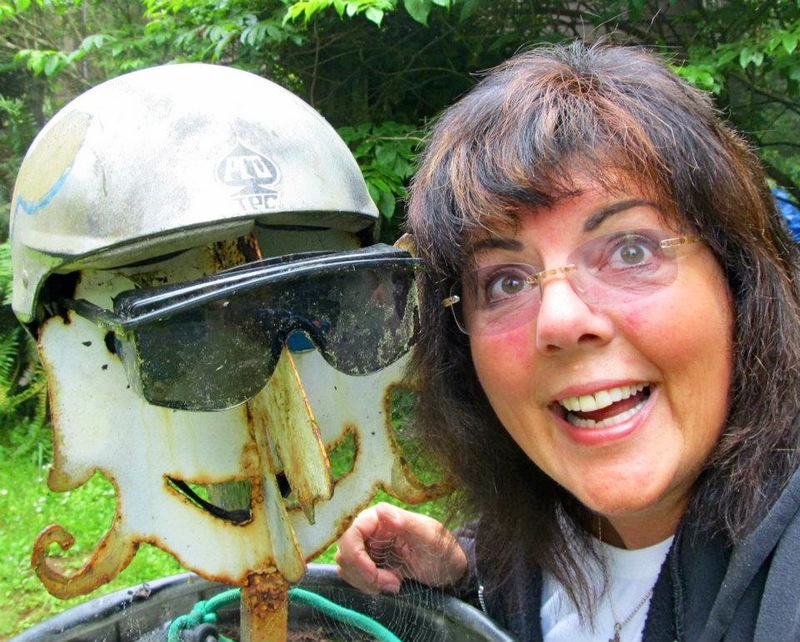 Helmet returned = happy Phylis! This entry was posted on Friday, August 3rd, 2012 at 9:58 am	and is filed under News. You can follow any responses to this entry through the RSS 2.0 feed.